The first popular hair transplant treatment began in the 1960. It was crude by today’s standards but must have seemed miraculous to both doctor and patient at the time because it actually worked. The method was very simple to learn and easy to execute. An area in the back of the head was shaved and numbed. Then a punch tool of between 2 and 5 mm in diameter was used to punch out round groupings of hair bearing skin. A plug looked like the round pencil eraser you’d see at the end of a pencil. If one looked closely at the perimeter of the tissue, individual follicles could be seen with little hair stubbles exiting from them. Then a punch was then used to remove a pieces of bald skin from the intended recipient area and the round grafts “plugged” into the holes. The “plugs” would heal and actually begin to grow hair from the follicles it contained. Moving large chunks of hair and simply implanting them into bald skin created the most unnatural distribution you could imagine. Even a child could tell something was not right. The problem was that because the plugs were large, the spaces between the plugs likewise had to be large in order to leave enough blood vessels in the area to allow the plug to heal and reconnect to the body. Put too many plugs too close and you wind up with dead plugs and dead surrounding skin. So the gaps between the plugs made the entire hair transplant stand out as “pluggy” or “dolls head” like. If a patient had some hair around the plugs at the time of the surgery but over time lost that hair with age the plugs would being to stand out monstrously. Only a few plugs could be harvested at any given time. Usually between 50 and 200 depending on the size of the punch. Compare that to the thousands of grafts removed during today’s single-visit FUT procedures. Without the ability to move much more hair in a single sitting a plug patient may look very unnatural until all the procedures were finished. When the donor area was examined it looked like it had been in a car accident. The trauma from the multiple plug extractions was tremendous which resulted in a lot of scar and subcutaneous fibrosis. Not just where the plug was removed, but in the surrounding areas as well. This excessive scarring is also a problem with today’s FUE procedure and it is proving to be more of a limiting issue than most practitioners originally thought. For all it’s drawbacks one could not deny that plug surgery worked at its core. So some smart doctors decided to take the plugs out and then dissect them into smaller bits. Not quite “Follicular Unit” level, but somewhat close. This was called Mini and Micro grafting and it worked very well. By placing the follicles back into the bald scalp with a more even distribution the natural look of the final result increased by an order of magnitude. So instead of implanting one massive plug containing 21 hairs they broke up the plug into seven 3 hair minigrafts. 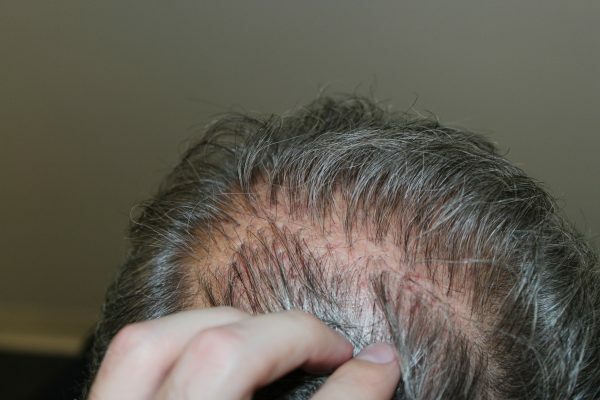 This process worked so well that doctors began to wonder if there was any way to get out more follicles in a quicker manner without increasing the trauma to the donor area. And thus the Strip procedure (FUT) was born which kicked off the modern hair transplant industry.